Fleet Readiness Center South West (FRCSW) is the name of NAVAIRs principal site in the southwestern region of the United States. FRCSW began in 1919 and. 1 Fleet Readiness Center South West (FRCSW) is the name of NAVAIRs principal site in the southwestern region of the United States. FRCSW began in 1919 and is headquartered at Naval Air Station North Island. Fleet installations in the United States, and all over the world, send their aircraft, engines, and components to FRCSW for repair for: -Major modifications -Scheduled maintenance -Repair from crash or battle damage FRCSWs mission is to provide top quality products and services at the best value in the fastest time. While accomplishing their mission, they are obligated to be environmental stewards. The Environmental Department within FRCSW is responsible for implementing environmental laws and regulations, water and energy conversation plans, and minimizing environmental impacts to ensure FRCSW remains environmental stewards. By performing tasks such as: -Irrigation System Audits -Energy Audits -Reviewing energy and water usage data We were able to become part of the great environmentalist team. Aircraft Environmental Support Office (AESO) is a department within FRCSW that is involved with supporting the environmental aspects of aircrafts. In particular AESO is involved with testing emissions from aircraft engines to ensure that they are within the Environmental Protection Agencies (EPA) limits for emissions. AESO engineers, mechanical and environmental, have a lab in their office to test emissions or a mobile lab to take anywhere in the world. The main method practiced by FRCSW is one of environmental awareness and energy conservation. In the AESO and Environmental department, we are concerned with the effects our facilities and practices have on the environment, both spatially and temporally. AESO A chief research objective of our department is to formulate simple yet effective testing procedures that will allow for shorter testing time. AESO performs emissions analysis on aircraft engines. Procedures used today require engines to be run upwards of 3 hours non stop to perform single tests. With multiple tests being done several times, a single engine could take a week to test. AESO is trying to come up with tests that would only take a few hours to perform. This way an engine could be tested in half a day. This would save tremendous amounts of fuel and overhead, while giving equitable results faster, and helping conserve energy. Environmental Office has several main objectives: -To ensure proper water/energy audits are done -Identify key areas where energy and water can be saved -Construct and implement conservation plans An onsite irrigation audit in one of the buildings was performed in order to comply with the water conversation plan proposed by FRCSW. The purpose of an irrigation audit is to provide: -Landscape information -Identify areas where water is being wasted -Help produce a Yearly Estimated Water Use (EWU) budget -Help determine water saving plans and goals During our irrigation audit, we were able to identify a few key issues that resulted in an increased water usage. -Over watering which results in run-off -Poor sprinkler placement (watering no plant life) -Sprinkler pressure is too high creating fogging which contributes 10% to 15% water waste due to evaporation -Sprinklers are spraying pavement also wasting water Possible solutions to our key issues included: -Proper irrigation maintenance and sprinkler placement -Creating a watering schedule suited to current plant life -Installing pressure valves to help control water pressure Using our gathered data, like landscape square footage, we were able to calculate a yearly EWU budget to help determine where our water usage needs to be at. Our current usage from June 2007 to June 2008 is 3205.2 KGAL. Our estimated water usage is only 447.6 KGAL. 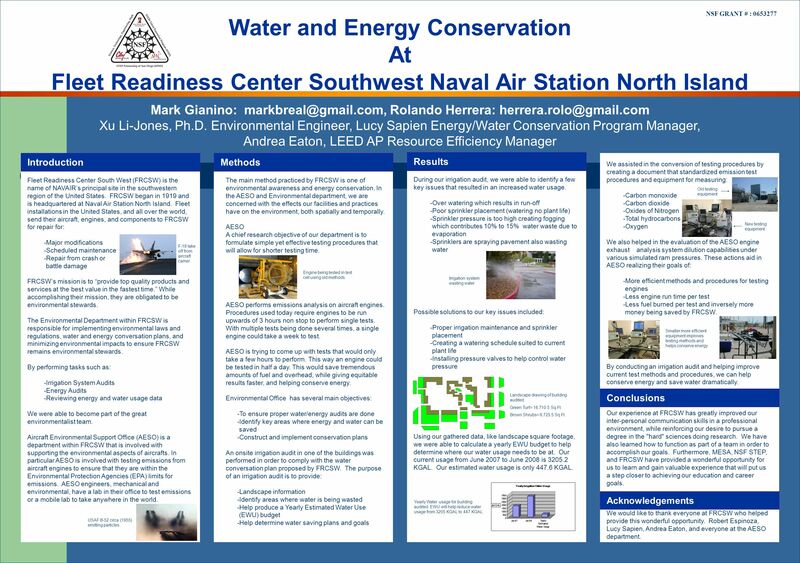 Water and Energy Conservation At Fleet Readiness Center Southwest Naval Air Station North Island Mark Gianino: markbreal@gmail.com, Rolando Herrera: herrera.rolo@gmail.com Xu Li-Jones, Ph.D. Environmental Engineer, Lucy Sapien Energy/Water Conservation Program Manager, Andrea Eaton, LEED AP Resource Efficiency Manager NSF GRANT # : 0653277 IntroductionMethods Conclusions Results Our experience at FRCSW has greatly improved our inter-personal communication skills in a professional environment, while reinforcing our desire to pursue a degree in the "hard" sciences doing research. We have also learned how to function as part of a team in order to accomplish our goals. Furthermore, MESA, NSF STEP, and FRCSW have provided a wonderful opportunity for us to learn and gain valuable experience that will put us a step closer to achieving our education and career goals. Yearly Water usage for building audited. EWU will help reduce water usage from 3205 KGAL to 447 KGAL. Landscape drawing of building audited. Green Turf= 16,710.5 Sq.Ft. Brown Shrubs= 8,725.5 Sq.Ft. Irrigation system wasting water We assisted in the conversion of testing procedures by creating a document that standardized emission test procedures and equipment for measuring: -Carbon monoxide -Carbon dioxide -Oxides of Nitrogen -Total hydrocarbons -Oxygen We also helped in the evaluation of the AESO engine exhaust analysis system dilution capabilities under various simulated ram pressures. These actions aid in AESO realizing their goals of: -More efficient methods and procedures for testing engines -Less engine run time per test -Less fuel burned per test and inversely more money being saved by FRCSW. By conducting an irrigation audit and helping improve current test methods and procedures, we can help conserve energy and save water dramatically. Acknowledgements We would like to thank everyone at FRCSW who helped provide this wonderful opportunity. Robert Espinoza, Lucy Sapien, Andrea Eaton, and everyone at the AESO department. Engine being tested in test cell using old methods. Old testing equipment New testing equipment Smaller more efficient equipment improves testing methods and helps conserve energy USAF B-52 circa (1955) emitting particles. F-18 take off from aircraft carrier. Download ppt "Fleet Readiness Center South West (FRCSW) is the name of NAVAIRs principal site in the southwestern region of the United States. FRCSW began in 1919 and." Airport Sustainability Planning Charlie McDermott, LEED AP Planning Department Manager C&S Companies. Let’s Get Energized Saving Energy At School Sites. John Chomel Lead Estimator Cramroofing.com Our mission is to establish long-term relationships with quality oriented customers by exceeding. DEPT OF ESTATES AND FACILITIES Engineering Team DEPT OF ESTATES AND FACILITIES Engineering Team Too hot, too cold, just right Presented by: Russell Smith. Becoming Part of the Solution... …by committing to preserve the beauty that surrounds us, and to heal the planet for future generations. Green School Initiative Institute for Sustainable Energy At Eastern Connecticut State University “ It’s not easy being GREEN ! ” Kermit T. Frog. WATER CONSERVATION CEAL Meeting May 6, Goals  Manage water usage responsibly and efficiently;  Use recycled water when possible;  Create sustainable. + Careers in Electricity. + Outcome for today: Outcome EL6.1: Assess personal, societal, economic, and environmental impacts of electricity use in Saskatchewan. Energy Audit- a small introduction A presentation by Pune Power Development Pvt. Ltd. They also develop power- using machines such as refrigeration and air- conditioning equipment, machine tools, material handling systems, elevators and. The Electric Car By: Anan Patel.